Thank you for considering a donation to our deserving dogs. Incorporated in 2008, our organization was formed in an effort to change the luck of rescue dogs forever. We work with the community, other shelters and rescue groups to restore the health of the dogs that come to us. We tend to their physical health with veterinary care and prevent further overpopulation by spaying and neutering. Our setting also tends to their emotional needs by providing a pack family that will socialize them. The combination of meeting these needs prepares them for adoption as your next much loved family pet! We are located on a 125 acre family farm that is also home to our own dogs. Each new dog is welcomed and cared for in clean, and secure kennel areas before being introduced to the others in our care. Days begin with an early morning walk through a combination of woods and pasture trails. 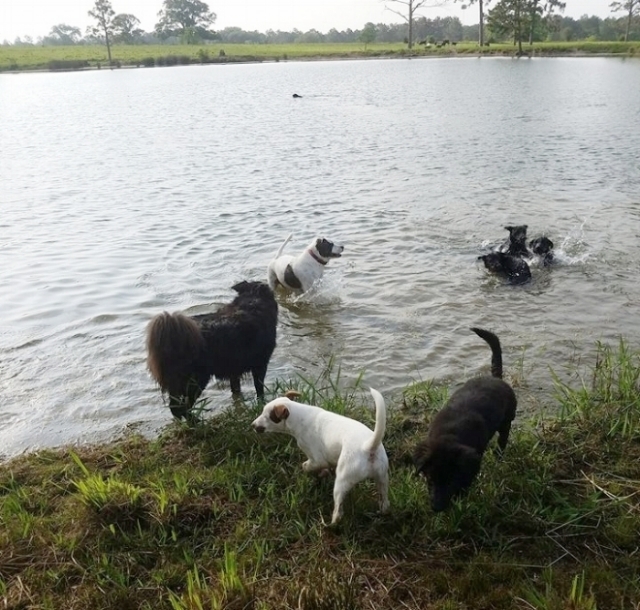 The dogs have the opportunity to exercise, and often complete their walk with a splash and swim in our pond. Usually before dinner is served, there is another long walk about the farm to finish the day.